BSBA has a membership of Britain's best boot fitters and affiliated retailers where they can be found. We provide a benchmark for boot fitting excellence and peace of mind for customers as to where to buy your boots. Individual BSBA members have these boot fitting skills and BSBA retail members have satisfied our stringent membership criteria. Use our member finder to find BSBA members near you to give you peace of mind and guarantee you get the best boot fitting in the industry. We strongly believe that ski boot-fitting is a professional, technical trade and we, and the ski industry, feel that there is a need for accreditation, which has not existed prior to BSBA forming. We exist to promote the trade and support accredited boot-fitters and their employers. Only by having an independent association can a meaningful accreditation scheme be achieved. 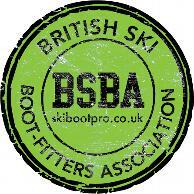 BSBA is an impartial body and has no bias towards specific products or retailers, we just want ski boot fitting to be given the recognition it deserves and to improve standards. We provide nationally accredited training courses, run by skibootpro training, and we are supported by all major suppliers of ski boots, footbeds, technical socks, custom liners and important ski industry bodies.